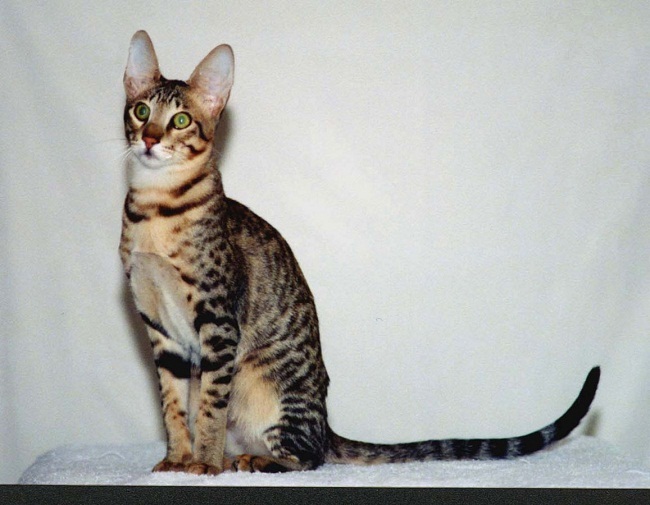 The Serengeti, a cross between an Oriental Shorthair and a Bengal Cat, is a medium-sized domestic cat with a strong, muscular, and square stature. Even though the Serengeti has some structural similarity with the Oriental Shorthair, its distinctive long legs and neck gives it a taller and much more upright appearance. The strikingly large ears with round tips have a length equal to its head and its large round eyes usually have a gold to amber hue. The creation of the first Serengeti cat back in 1994 is attributed to Karen Sausman, a conservation biologist who is also the owner of a cattery based in California. 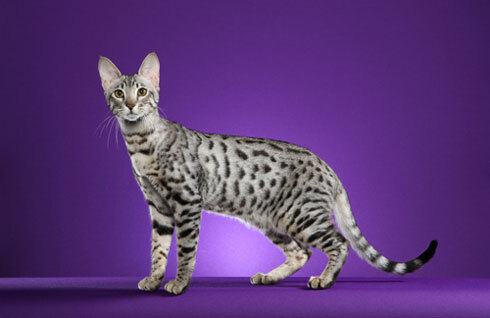 She always wanted to develop a new domestic breed that resembles the African wild serval cats. 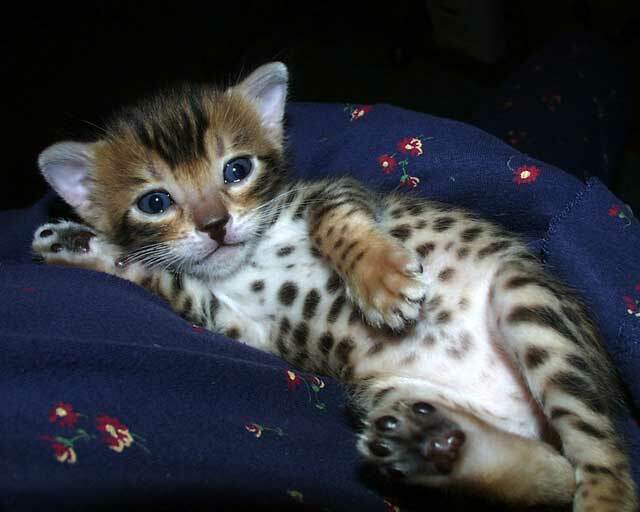 However, the Serengeti she developed had no serval blood. In 1995, a project for the development of the breed was started and now they are bred throughout the USA, Australia, and Europe. 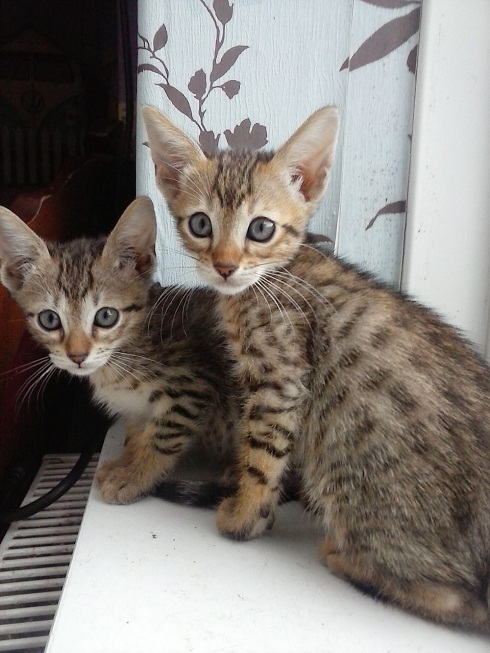 These cats are registered with TICA and have been included in the group of Preliminary New Breeds. They show signs of initial shyness when taken to a new place, but the confident, friendly, and outgoing Serengeti cats can quickly adjust to their surroundings and family members. They enjoy human company and develop strong bond with their owners, often following them and helping them in their tasks. These sociable cats do well with kids, but supervision is required as they sometimes exhibit unpredictable behavior. They can mingle freely if introduced to strangers and household pets at a young age. 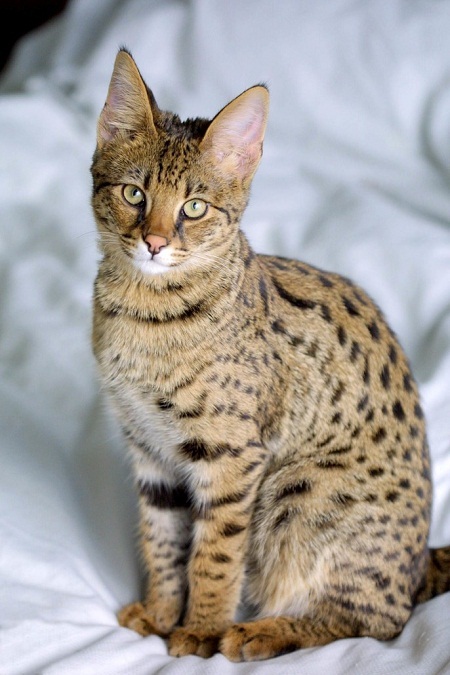 Even though the Serengetis are not lap cats, they may purr and demand to be cuddled and stroked. Like their Shorthair parents, the Serengetis are independent thinkers. They do not get bored while their owners are away and may keep themselves busy by playing with toys and exploring their surroundings. As a talkative cat, the Serengeti likes to communicate with frequent meowing. Being an average shedder, the Serengeti needs occasional brushing and combing to keep its fur free from dead hairs. Wipe clean your pet’s coat with a soft piece of cloth once or twice a week, otherwise it may lose its shine. While grooming your cat, it is advisable to check its large ears that might accumulate dirt. You can simply use a cotton ball dipped in a cat cleanser to wipe its ears gently. Clip your pet’s claws every two weeks to remove all the dead layers of nails. Trimming is also needed to avoid ingrown nails and to prevent toenail infections. Cleaning its teeth two or three times a week with a vet-approved toothbrush will keep away dental disorders. 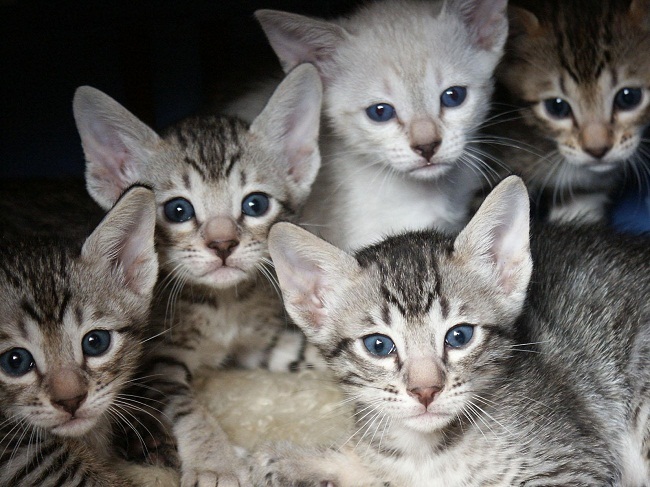 These cats are usually affected by some health concerns including vomiting, diarrhea, and feline lower urinary tract disease that may lead to formation of bladder stones. Serious symptoms like irritation of bladder lining, development of urinary tract infections, and painful urination are associated with the formation of bladder stones. Take your Serengeti to an experienced vet to get it immunized against feline distemper as well as upper respiratory infections (FCV and FHV-1). The Serengeti is an energetic cat that likes to keep itself engaged in activities. 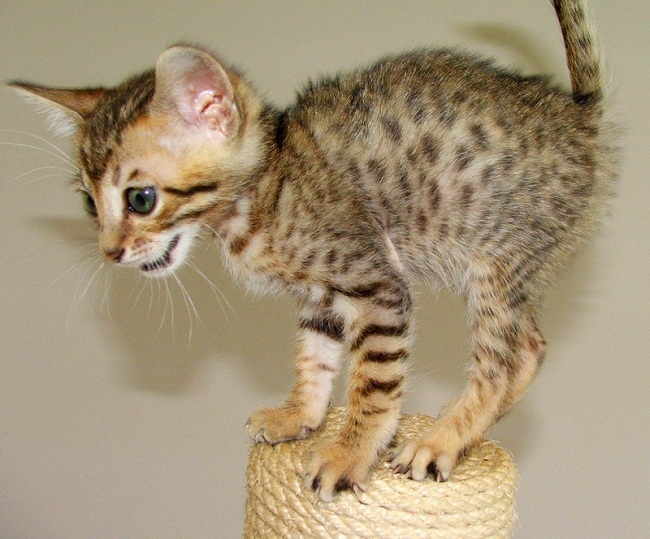 It enjoys running and may climb atop the refrigerator, the counter, or some other higher spots in the house. Thus, a cat tree will give it a good workout and satisfy its natural tendency to climb and leap. Regular playing sessions that involve running, chasing, and pouncing are needed to burn off its energy. Interactive games like playing fetch will help to build a strong bond between you and your pet. 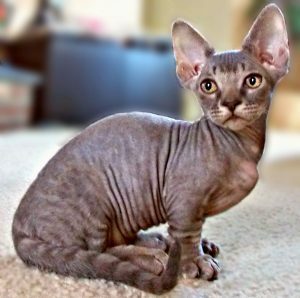 No training specific to this breed is recommended, but provide socialization and obedience training to help the kittens learn the basic rules of living with a human family. Make sure your pet gets a nutritious diet containing the right amounts of protein, carbohydrates, fats, vitamins, and other micronutrients. While raw meat is a good source of protein, complete and balanced commercial cat foods can also provide your Serengeti cat with all the essential nutrients. Give plenty of fresh drinking water to keep it well hydrated. Some of the breeders are now trying to get the TICA to accept the snow spotted Serengetis. 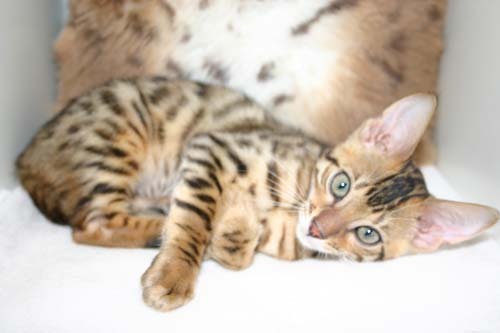 In the UK, the tabby variety is called the brown-spotted. 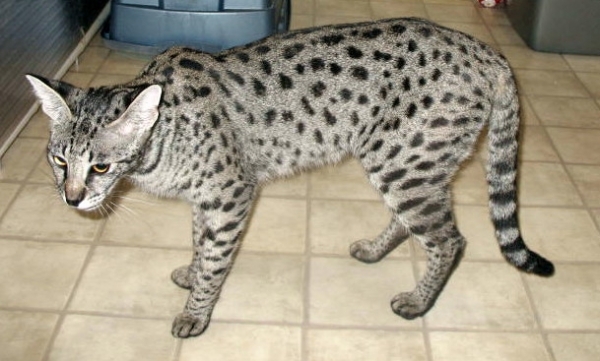 Published on July 23rd 2015 by Jack Steaven under Hybrid Cats,USA Cats. Article was last reviewed on 26th May 2017.